Samsung Galaxy Note 2 has finally made its way to the markets. It's run on Android v4.1 (Jelly Bean) OS. It comes with a 5.55- inch Super AMOLED display with 1280×720 screen resolution. It has 16 GB internal memory expandable up to 64GB with Micro SD card slot. And it powered by a 1.6 GHz Cortex-A9 processor. It comes with 8 MP Primary Camera with full HD recording supported and 1.9 Megapixel Front facing Camera with video calling facility. A Led flash light enable with camera. Full HD video recording enabled with 1920×1080 pixel resolution. It has Li-Ion, 3100 mAh battery it enables more stand-by time. Music player support MP3, MIDI, eACC+, WAV and FLAC audio formats. Video player support MP4, DivX, XviD, WMV, AVI, FLV, MKV, WebM, H.264 and HD Video Playback supported. 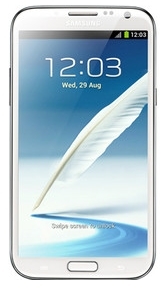 Samsung Galaxy note 2 enabled Wi-Fi, GPRS, and EDGE. 3G enabled with 21 Mbps HSDPA, 5.76 Mbps HSUPA it gives super-fast internet browsing and downloading. Camera also features Face and Smile Detection, Geo-tagging, Auto Focusing, Touch Focusing, Image Stabilization & Image Editor. Primary Camera, WiFi, S Pen, Popup Note, Air View, Easy Clip, Handwritten Notes via Email, Quick Command, S Note, Voice Input.